The humid weather calls for an ice cream. Though the weather has cooled considerably, now. 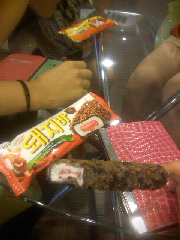 I have no idea why this particular ice cream is called, literally, Pig bar. Funny. Why pig? !